As we get older and acquire more possessions moving can become more complicated. It’s easy to move your t-shirts and video games from your parents house to your first university dorm room, but once you have a whole family to worry about it becomes a different situation altogether. In this top ten tips for making moving easier article I will lay out a few ideas that you can use to make your next move a breeze. While it may be tempting to just go down to the grocery store and ask for some old boxes, this might turn out to be a bad idea. Often these boxes have been sitting in warehouses for a long time, meaning that they might have bug eggs – or even live bugs. Like cockroaches. New boxes can be purchased inexpensively from a variety of sources. Trust me, you’d rather spend a few dollars on boxes now than have to hire an exterminator in the future. Be sure to wash your clothes and clean your curtains, decorative pillows, and linens to avoid mold and unpleasant smells. Also, it’s a good idea to wipe down and dust off other objects, no reason to bring that to your nice new home. Trust me the last thing you want is to find out that there has been a mix up while you are already on the road with most of your worldly possessions in a rented box truck. Be sure that these three things are taken care of before you set out on the road: 1. Inform your place of employment that you will have limited availability during the moving process; 2. Make sure that you and your family are all on the same page about where to be and when; 3. Be sure that any help you have hired is aware of where they need to be and when. Don’t assume that children know how to pack things in a logical and efficient manner unless you have good reason to believe that they do. This a good chance for you teach them important life lessons about efficiency and organization. Like all professionals movers vary widely in terms of quality. It best to check online review sites and, if possible, get a recommendation from a trusted friend or acquaintance. 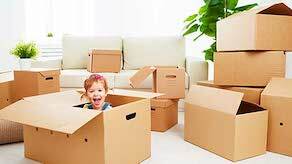 Organize your boxes according to where they are going in your new house and drop them in that room so you already have them organized for unpacking. This will prove much easier than moving all of the boxes into area and then moving them to their respective destinations later. It’s important to clear as much of schedule as possible (within reason) to complete the moving process. It’s better to move all of your belongings over a period of two or three days than to strain yourself to move it all in one day. Invite your family and friends to help, it can be a fun a time for all of you and you can throw a little bar-b-que or cocktail party to thank everyone. Just be sure to return the favor! As you are packing your belongings be sure to have a couple of boxes set up receptacles for donations or trash. This is the perfect opportunity to get rid of some unnecessary clutter. Moving doesn’t have to be chore, let the kids play with old toys from the attic, tell them interesting stories about your family heirlooms, reminisce about the good time in your old place with your spouse. Just don’t let the process stress you out! I hope you have found some helpful tips on how to make moving easier. Moving can seem like an overwhelming task, but it certainly doesn’t have to be.